Mike A. asks: What is the difference between bees, wasps, and hornets? There are many similarities and differences between our little wing-whipping friends. For starters, all can sting you. That said, you may derive some solace in the fact that when certain of them sting humans, they die- not so when they sting many other animals. The barbed stingers on honey bees particularly end up getting lodged in our soft flesh, ripping out their backsides when they try and get away after stinging you. When they sting most animals, this doesn’t happen. Further, all three live in hives or combs. These humble abodes are always in cooler and sheltered areas, often within the shade of trees. 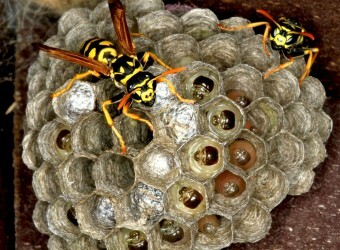 Bees, wasps, and hornets all proliferate in warm weather, their hives growing in the spring and early summer. By late summer, food becomes scarce and that’s when they, especially wasps and hornets, start finding their way to human food and your picnic. While the colors are all pretty similar (brown/black, yellow, with some white) on bees, wasps, and hornets, the markings differ. This is where the insects we all tend to lump in the same category (flying, stinging, and scary), begin to show their differences. We start with the humble bee. 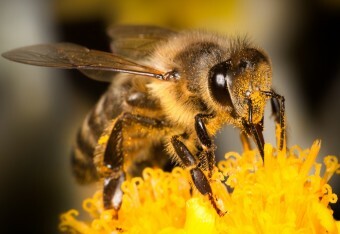 Bees are furry pollen collectors, who rarely have any need to interact with humans. As the expression “as busy as a bee” insinuates, worker bees (usually the only type of bee most people will see) spend their lives going to and from the hive, acquiring nectar (and pollen on their bodies) during their trips. They play an integral part in the pollination of various plants, and some of them provide us with tasty honey. They feed the acquired nectar to their young, developing the new generation of bees. 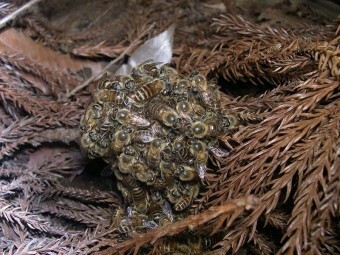 They also protect the queen bee, allowing her to lay the eggs. 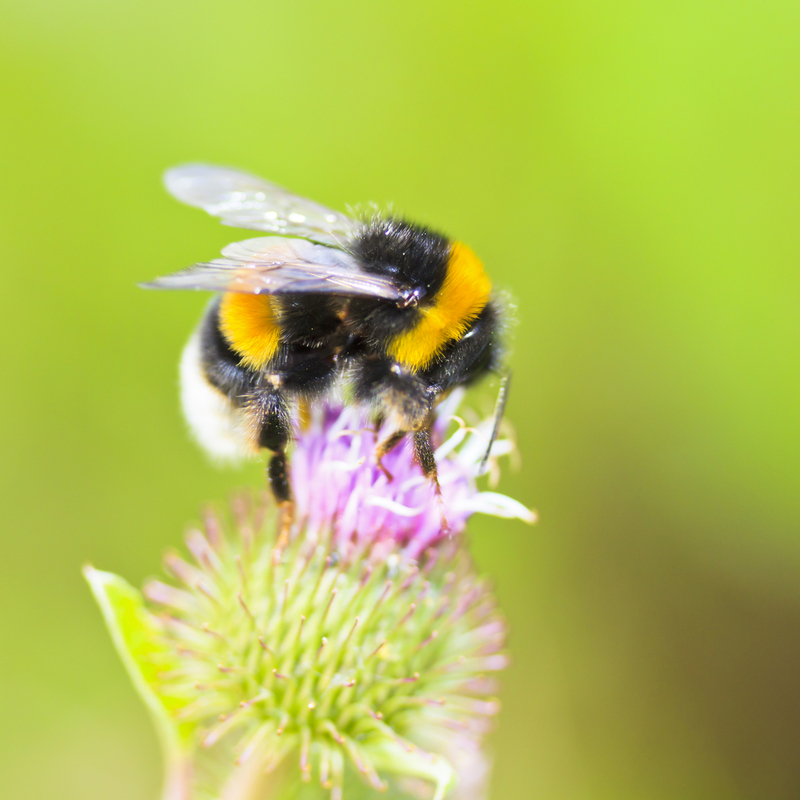 There are over 25,000 known bee species, but the two most common types of bees are honeybees and bumblebees. Both produce wax, but only the honeybee produces honey. Another big difference between the two is that the bumblebee is nearly double the size of the honeybee. Bumblebees are fat (at least in bee terms) and hairy, their size relative to their wingspan giving rise to the myth that science can’t explain how they are able to fly. Honeybees are more sleek. They both are yellow with black stripes, though the bumblebee often has a red/orange or white tale. Additionally, honeybees live in large colonies, topping out at 25,000 bees. Bumblebees tend build their nests underground (though they have been found in walls), and sometimes in tunnels constructed by other animals. Their colonies are much smaller than bumblebees, only numbering into the hundreds. Wasps, unlike bees, are aggressive and predators. There are over 30,000 species of wasps and they are distinguishable from bees by their pointed lower abdomens and narrow “waist,” a petiole, that separates the abdomen from the thorax. They also have little to no hair on their bodies (as opposed to bees) and don’t play much of a role in the pollination of plants. Their legs are shiny, slender, and shaped like cylinders. Solitary wasps do not form colonies and live under ground or in tubular mud nests. There’s no caste system, as in the queen cares for it’s own young. The queen seeks out prey – flies, bee larva, cicadas (there’s actually a species of wasp known as “cicada killers”), and paralyzes it with its sting. They take the still-living insect back to the nest and feed it to their larva. It’s during the late summer when wasps begin to get aggressive. This is due to the fact that the worker wasps job is done for the year and they’re, literally, waiting to die. After taking care of the queen and feeding the new generation of worker wasps, the old ones are now useless. They become disoriented and begin to venture away from the nest, in search of food and something sweet. It’s hilarious that, now worker wasps have finished their life’s work, all they are doing now is feasting on fermented fruit and getting ‘drunk’. All that being said, wasps aren’t just pests, but benefit humanity in some ways. They prey on many other “pest” insects and have actually been used by the agricultural industry as an effective means to control crop pests, resulting in a much more environmentally friendly way to do this over many pesticides. Hornets are actually a species of wasps. Hornets differ from other wasps in that their stings are more venomous (they contain more acetylcholine); they tend to attack for food as a colony, and their nests are all aerial (as opposed to many wasps species). 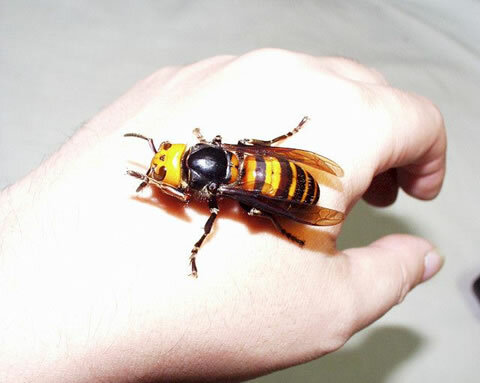 The Giant Asian Hornet, native to parts of Russia, China, Vietnam, and the mountains of Japan, can grow to be about 2 inches long with about a 4-5 inch wingspan. It is the world’s largest and most venomous wasp. It is colloquially known as the yak-killer, due to the venom’s ability to dissolve the tissue of even the largest of mammals. Because the honey bee is on an individual level incapable of harming the Giant Asian Hornet and just a handful of Giant Asian Hornets are capable of decimating an entire hive of honeybees, the Japanese Honeybee has come up with an alternate strategy to stopping the mass-destruction of their populace by the hornets. When the Giant Asian Hornet is detected, first the honey bee will emit a pheromone that the Hornet can pick up on that’s basically an “I see you” warning. The scouting hornet then may leave in this case. If not, and the hornet continues towards the hive, the honey bees will ball the hornet– essentially surrounding it completely with as many bees as possible. They will then exert themselves as much as possible to raise their body temperatures. Inside the ball, the temperature will rise rapidly, while simultaneously the carbon dioxide levels will also increase. Once the temperature inside the ball passes 115 degrees Fahrenheit or 46 degrees Celsius, it exceeds what the hornet can tolerate, but is still well under what the honey bees can handle (around 50 degrees Celsius). The combination of heat and low oxygen level will eventually kill the Giant Asian Hornet. Several of the honey bees will likely die before the hornet and this means of defense isn’t effective against a large number of Giant Asian Hornets, but it works well at eliminating the scouting Giant Asian Hornets, which can potentially stop a large scale attack from happening in the first place. Can Honey Go Bad or Make You Sick? 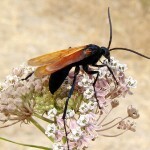 The “tarantula hawk” is extremely frightening to look at, but you can rest easy that they want nothing to do with you. These bright black and blue wasps find tarantulas, sting, paralyze, and drag them back to their nests. They then lay a single egg on the spider’s abdomen. When the wasp larva hatches, they feed on the still live, but unable to move spider. They avoid vital organs while feeding to keep their prey alive as long as possible. These “hawks” are docile and don’t bother humans, unless of course you step on their nest. In that case, their sting is considered one of the most painful of any wasp. Fortunately, the sting isn’t particularly venomous (swelling goes down within 48 hours), but the intense pain can last several minutes. 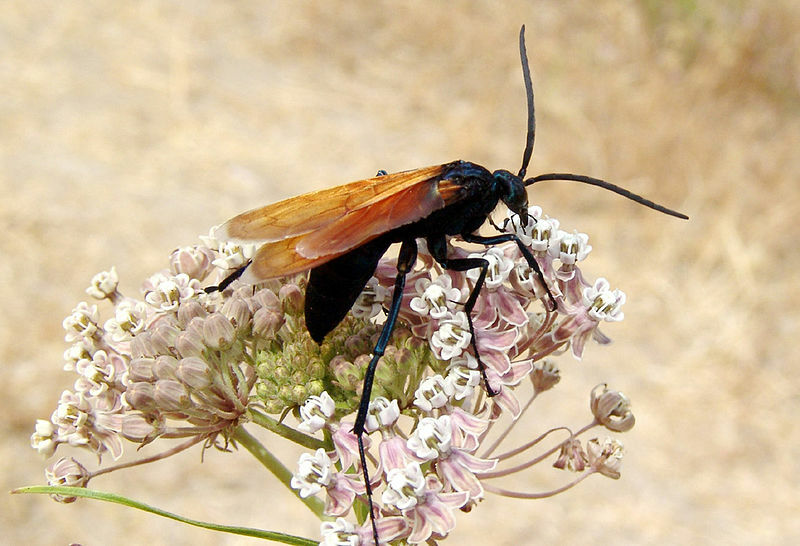 Parasitic wasps is a particularly type of wasp that lay their eggs inside of other insects (the tarantula hawk is this type of wasp, and the Jewel Wasp is another even more amazing example). The larva eventually hatch and feed on their host, ultimately killing it. These are the type of wasps that are generally used by the agricultural industry to control pest populations. A hornet sting is the worst, they’re the biggest of the species of wasps.